Unique in design, the scenic thrilling plunge down Camelback Mountain on CBK's new Mountain Coaster is an experience your not soon to forget! Seriously folks, this is the stuff lifelong family memories are made of. 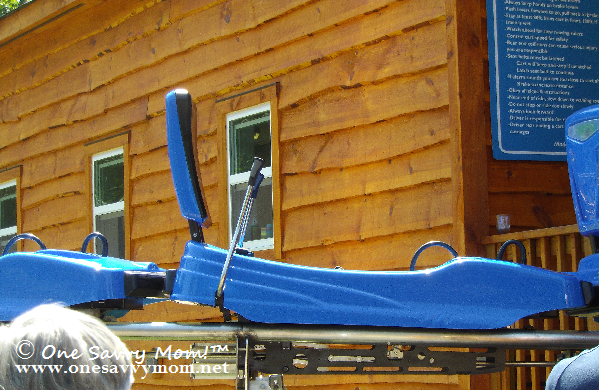 CBK Mountain Adventures celebrated the newest addition to their family of parks this week, in Pocono Pennsylvania. The Mountain Coaster is unlike any roller coaster I've ever experienced, and the setting is nothing short of breathtaking. Rider's are loaded into individual cars (pictured below) at the base of the mountain. Each car is equipped to carry 2 passengers (300lb weight capacity per car) and offers the operator complete control of achieved speed via the included hand controls (maximum attainable speed is stated as 30 mph). Once your seat belt is fastened, your car begins the 4,500 ft. climb up the mountain; each car is pulled up the mountain on the steel track and cable system. Once at the top, the pulley system releases the car and gravity takes hold! As you begin the almost mile long descent, your car winds through curves, straightaways and two 360 turns in a gorgeous natural setting. 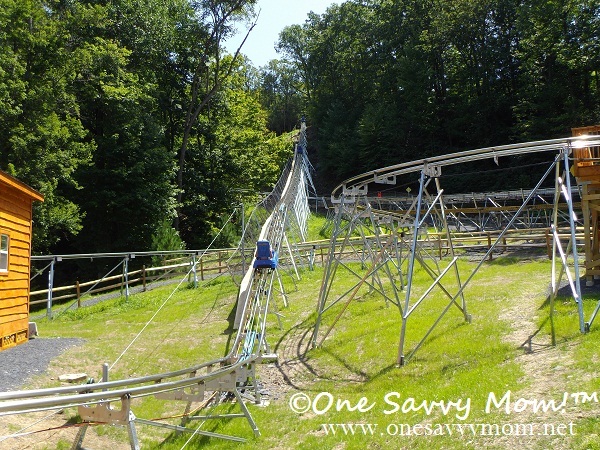 CBK's Mountain Coaster is currently the only one of it's kind in Pennsylvania and is one of only 10 Mountain Coaster's currently in existence in North America; making the experience all the more special. The Mountain Coaster joins the Twin Zip-Flyer's, as a part of the parks' 2012 $3 million dollar expansion project. Nestled in the picturesque Pocono Mountains, only a short drive from New York City, Philadelphia and points New Jersey, you'll find BIG opportunities for fun every season at Camelback Mountain. The Camelback family of parks boasts Winter sports (skiing, snow tubing, and snowboarding), one of the largest outdoor water parks in the country (the largest in Pennsylvania) and a mountain adventure park where thrill seekers can embark on one of a kind outdoor adventures. We'll definitely be returning to Camelback for more family fun; the Zip-Flyer looks pretty amazing and snow tubing is at the top of my list of thing's to do with my family this Winter. I can't think of a better place to hang out with my family; the staff is among the friendliest that I've encountered in a long time!